The Gondorian army was the primary military body of the Gondorian armed forces, serving alongside the Royal navy. A direct descendant of the Royal Model Army of the Ship-kings and older Númenórean armies, the Gondorian army maintained a similar level of discipline, strategic prowess and organization. It was among the most effective armies of western Middle-earth. During the Fifteen Years' War (1652-1666) it was able to fend off major incursions from all quarters while fighting equally destrucive civil war against various pretenders and their hosts. The Great Plague in 1635-38 had sapped Gondor's military strength to the point where Aldamiri reorganisation of Gondor's army became impossible to maintain. In addition, most of the Aldamiri navy had been sunk or captured during the Great Raid on Pelargir. Thus King Tarondor and his chief steward Arandur Dior Húrinion Usulúni were forced to begin the rebuilding of Gondor's military force from scratch. This great buildup was immensly expensive for the state. Post-plague Gondor quickly exhausted its silver reserves; any deficit was covered by monetary debasement, selling of goverment property and future revenues for cash. Although crippling to the economy in the long run, this bold strategy paid off in the long wars of the 17th century. Army of Gondor in 1650 was only half of its 1620 strength. Gondorian navy was in even worse shape, having only a handful of servicable warships. Territorial army had lost at least 20,000 men over a period of ten years to plague. Worse still, as royal revenues dwindled, soldiers were paid only once in three years. In some cases pay was first postponed and then suspended. Many frontier regiments either deserted or crumbled into oblivion. Sangahyandion had taken advantage of Gondor's destitute position and snatched the southern parts of Harondor almost without a fight. In 1643 , king Tarondor had disbanded badly depleted field armies and combined them into a single Royal Host (Dagarim Aran). It was smaller than before but highly versatile, mobile and efficient force, and possessing excellent logistic capabilities. Royal Host was trained to fight either at full strength or as an array of isolated detachments. Territorial Corps were divided into four groups which served for a full year on a rota basis once every three to six years, so that a small core of regulars was available at all times. Raising and maintaining the territorial forces fell under responsiblity of local lords and governors, as well as building new fortifications. The territorial armies were stationed in the provinces, and their greater independence from central command means that they were able to deal with threats quickly at a local level. The over key advantage of the decentralised system was that it conserved royal revenues and offered the Gondorian state good value for money, at the cost of lower strategic mobility and logistical support. There was little uniformity in the post-Plague territorial army, and the new fortifications were most basic and often cheaply built. "Strive at all time to have the fleet in top condition and to have it not want for anything. For the fleet is the glory of Gondor. [...] The dromundhîrs and aerhîrs of the fleet should investigate with rigor the slightest thing which is done to the fleet. For when the fleet is reduced to nothingness, you shall be overthrown and fall." - Admonitions to the King, from the Strategikon of Elenaerion. The new Royal Navy was built around a nucleus of small fleet of large men-of-war reinforced by ships requested by the Crown in times of need. A ship levy of Odo Lynd (S. "seven ports") instituted by Aldamir in 1496 was extended to four more haven towns. These havens agreed to supply a number of warships in return of tax reductions and privileges. Gondor's wealthy merchants and noblemen provided a second source of ships. King hired vessels, equipping them for war. Few were well-suited for battle. Quick and unforeseen recovery of the Royal Navy was due to the energies of one man: Elenaerion, Captain of the Ships. He took great care of Gondor's strategic resources, even personally planting new forests for timber. 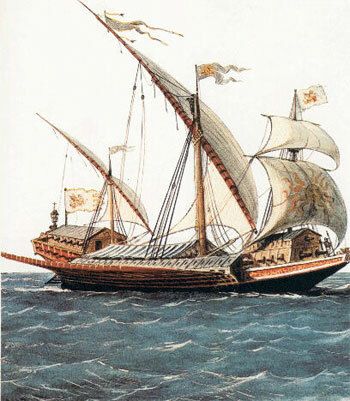 Elenaerion favored the building of great galleasses instead of carrack-type sailing ships, and instituted a new, highly professional coastal navy, which became his most prized creation. King Tarondor, of course, adopted the idea as his own. The new Coastal Navy was an independent organisation, with army-like command structure. Tarondor was heavily influenced by Elenaerion's ideas of large-scale amphibious operations, where better-armed Gondorian troops could overwhelm their more skilled Umbarean adversaries. These ideas where put to test in 1663, during the Fifteen Years' War, when the King personally led a great naval assault on Harondor. Captain of the Hosts: (Berthir dagarim). Commander-in-chief, top-level military command in Gondor, dating from the reign of king Siriondil. This powerful office was often the power behind the throne and was held by commanders like Tarannon Falastur and Minalcar Rómendacil I.
Captain-General of Gondor. Equal to Marshal, commander of a host composed of two or more armies. Masters of Horse (Herdir roechbin). Commanders of five or more companies of horse. 1640-1653 Belatar Araglas, commander of the army in Rhún. 1654-1663 Durandir Astirian, commander of the army in Rhún. Brigadiers (Condir). Commanders of several companies or auxiliaries. Masters of Foot (Herdir vagorim). Commander of five or more companies of foot. 1652-1663 Callo Telengaur, commander of the field army in Ithilien. 1663-1670 Bregor Badhor, commander of the Harondor territorial corps. Colonels (Autherdir). Commanders of companies. Captain of the Federates. Commander of the allied troops. Captain of the Ships (Berthir ceiriath). Equal to the Admiral of the Fleet and president of the Navy Board. Autonomous top-level military command. 1653−1670 Tarlanc Amaltar-Roval, flag admiral of the Linhir Fleet.